All winter long! Mablethorpe Sand Racing – Get Involved! For 49 long years the famed Mablethorpe sands just 6 miles along the coast from Skegness has been the venue for a solid bunch of weather hardy Dirtbike enthusiasts that battle the elements to drift all manor of Dirt and Road going machines around the 600 odd metres oval circuit. 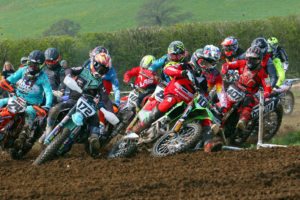 But like many Off Road events it has fallen on harder times and the number’s have dwindled so they are calling on the Off road community to come out and support these historic event’s so it can continue for another 50 years and beyond. race… or your minibike, Quad, Grasstracker, Sidecar or your Road going machine as long time Mablethorpe stalwart Guy Martin does, with his latest steed being an Africa Twin. Road bikes just need a set of knobbly tyres, a lanyard cut out and your on the sand. If you are into quirkiness, ie Dirtquake, and the Inappropriate class at Scunthorpe Speedway… and you won’t be disappointed here either as a whole host of man made contraptions will be seen on track with a Calor Gas petrol tank being one of our favourites. Events take place every fortnight during the Winter Months/Off Season from October until March with the next being this Sunday 17th December. Signing on starts at 8am with the racing taking place aprox 2 hours later. As a private club entries fees are low with your first meeting costing £50 which includes your membership with all of the following meetings being £35. Riders get a 4 lap practice then 5 four lap races with Trophies for the top 3 in each class and then trophies for the overall’s at the end of the season. Food and hot drink’s are available at the events.